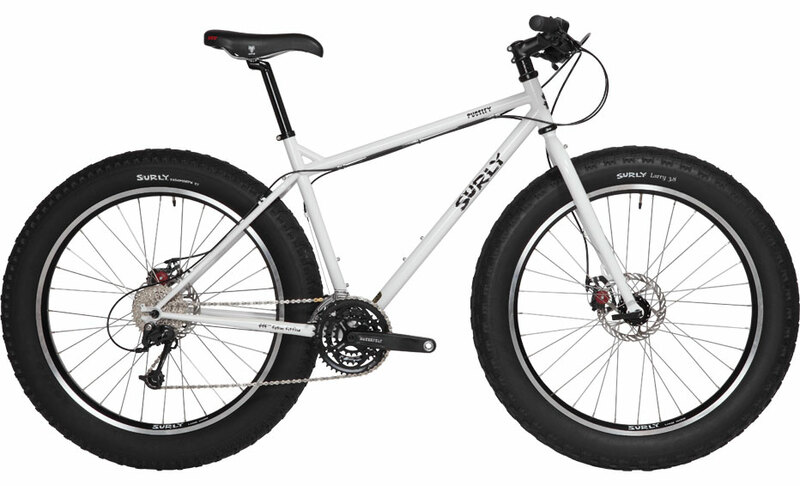 By now you know that Pugsley was created to go where standard “all terrain” bikes flounder. The floatation and traction afforded by large-volume, low-pressure tires can get you over and through otherwise unrideable terrain…sand, mud, wet rocks and roots, ice and many kinds of snow. The Pugsley frame has 135mm-spaced horizontal rear-loading dropouts with a derailleur hanger. This means you can set it up with a derailleured drivetrain or an internally-geared hub. Run it with a singlespeed freewheel or a fixed cog. You have lots of drivetrain choices. The stock fork accepts a 135mm rear mountain hub, just like the frame. This makes it easier to install and remove the wheel (a big tire on a big rim benefits from a wide opening), and it allows front and rear wheel interchangeability. This means you can have the ability to carry another full gear cluster, a singlespeed freewheel, or a fixed cog on the front wheel. And should something go wrong with your primary drivetrain, you have the option of swapping wheels and continuing on your journey or retreating to a place where you can make necessary repairs. In addition to the frameset, we offer the Pugsley as a complete bike. It features Large Marge rims with Larry and Endomorph tires, plus a nice mix of components chosen for their durability and value.